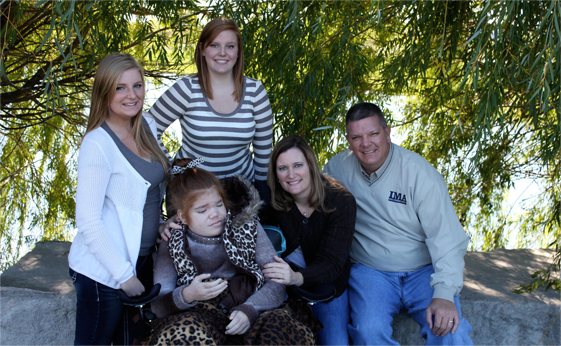 Megan was diagnosed at the age of four with Mucopolysaccharidosis Sanfilippo A (MPS IIIA). MPS IIIA is an enzyme deficiency meaning Megan didn't have the enzymes to break down the sugar cells her body produced. Megan also had a procedure in 2006 to lengthen the ligaments in her ankles in hopes to help her walk for a longer period of time. In January of 2009, Megan had the procedure for a G-tube which allowed us to provide all of her meds and nutrition through the feeding tube and avoiding the risk of her aspirating. Also in 2009, Megan became wheelchair bound. Amazingly enough, when she was at school, RISE Learning Center, the awesome staff would actually get Megan in their pool for therapy and with assistance she could still walk in the pool. But in August 2011, she struggled with pneumonia several times and ended up at Riley Hospital for Children for treatment on three separate occasions. In September 2011, we were told to do something no parent wants to hear..."take your daughter home and start hospice care. She probably has just weeks to live." Obviously the docs didn't know Megan still had work to do on this earth. The weeks turned into months and she continued to amaze all of us! Then on May 25, 2012, with her family surrounding her, she earned her angel wings! We know that Megan is no longer suffering and is having a great time in Heaven with her Grandpa Bach, Uncle Pete, Uncle Joe, Grandma Dorothae and many others. But we still miss her so much and wish we could hug her one more time. We think of her daily and thank her for all of the GREAT memories she created with us! Thanks Doodle Bug! The mission for the Megan Weisenbach Foundation is to provide financial assistance to families that have children with special needs to assist with quality of life.